UK designed and manufactured DSM2/DSMX ultra micro 2.4GHz receivers. All of these receivers are fully compatible with Spektrum, E-flite, Parkzone and other DSM2/DSMX 2.4GHz transmitters and transmit modules. These receivers are not copies of Spektrum products. Most receivers are available with DSM2 & DSMX support. A synchronisation issue in firmware version 3.5.3 with some DSMX transmitters has now been resolved and stock receivers have at least version 3.5.4. 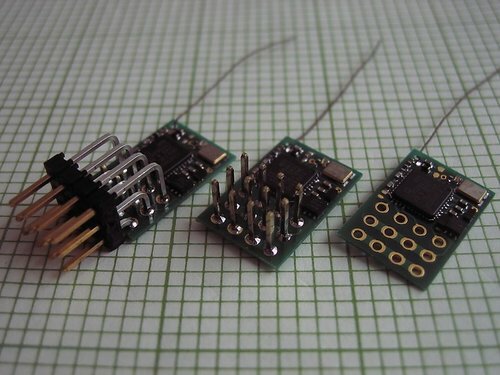 Receivers with only DSM2 (e.g. some Rx27) are marked as DSM2 only. Most of the receivers have a built-in 2A brushed ESC - the Rx31 is also available without the ESC FET fitted to save weight. All of the receivers have the throttle signal available, either via a connector or solder pads, so you can connect an external ESC. If you do use an external ESC, simply ignore the brushed ESC connectors. Rx31 is a DSM2/DSMX compatible 4 channel micro receiver without connectors to minimize weight. Channels 1-4 (Throttle, Aileron, Elevator, Rudder) are available as solder pads on the circuit board. The receiver can also support an on-board 2A brushed ESC with motor connection via circuit board pads. The receiver is also available without the ESC FET installed to save weight when a built-in ESC is not required. The Rx31 is available with and without the ESC FET installed for a small weight saving. It is also available configured for 7 channel output on the ch2 pad encoded as 16 byte RS232 serial or sequential PPM (aka 'SumPPM'); an inverted PPM signal is also generated on the ch1 pad. SumPPM is useful for driving a quadcopter controller. Please use the drop-down menu below to select the type you require: no FET and separate outputs; FET installed and separate outputs; serial output; and sumPPM output. View the Rx31 user instructions. The serial and sum versions of Rx31 produce a combined output stream on the ch2 pad and have no ESC fitted (the Rx31 connections image on the Deltang website is incorrect, the image above shows the correct channel and SumPPM/serial connections). Rx31d is a DSM2/DSMX compatible 4 channel micro receiver with twin on-board 2A ESC. 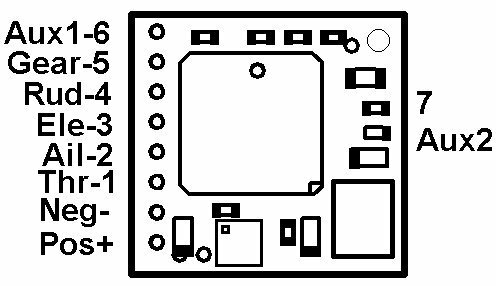 Channels 1-4 (Throttle, Aileron, Elevator, Rudder) are available as pads on the circuit board. The rudder or aileron channels may be mixed into throttle for differential thrust steering. Download the Rx31d user instructions. An adapter board MAG31d is available to convert Rx31d to use the Bahoma power connector system. Rx32d is a DSM2/DSMX compatible 9 channel micro receiver without connectors to minimize weight and with no on-board ESC. All channels are available as pads on the circuit board - requires soldering. The Rx32d is only slightly larger and heavier than the Rx31d but with 9 channels instead of 4 and supports DSM2 Surface for use with a Spektrum DX3 or DX4 as well as DSM2/DSMX Aero. 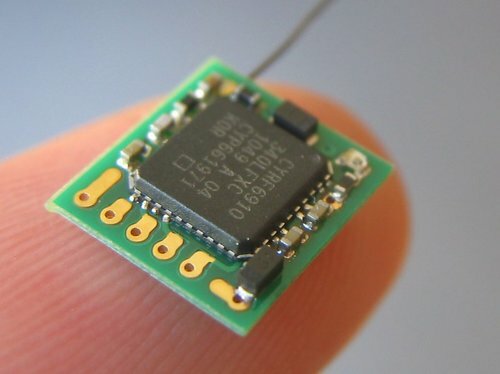 It has no on-board ESC or serial/sumPPM output. View the user instructions. Rx33 is a DSM2/DSMX compatible 6 channel micro receiver with JST-SH connectors. Channels 1-4 (Throttle, Aileron, Elevator, Rudder) have connectors, channels 5 and 6 (Gear, Aux) are available as pads on the circuit board. 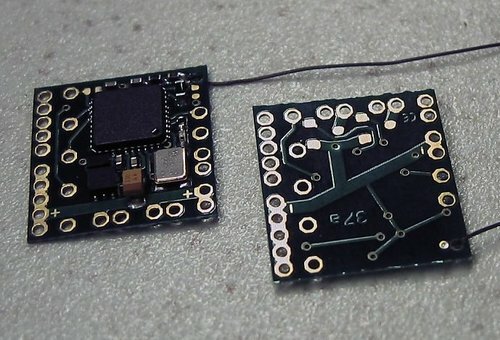 There is also an on-board 2A brushed ESC with motor connection via circuit board pads. An external ESC may be connected to channel 1 (throttle signal). Yes, the weight really is 0.65gm with connectors. Suitable 1mm pin space JST-SH connectors are available here. If the on-board ESC is used, power should be applied via the PCB pads as JST-SH sockets are not good for 2A - a suitable 'UM' battery lead is available here and the Rx33 is optionally available with battery and motor lead fitted. The 'UM' / JST-SH adaper lead is useful for powering the receiver via a JST-SH socket when used in a glider. View the Rx33 user instructions. Rx34d is a DSM2/DSMX compatible micro receiver, for 4-5 servos and 1-2 motors, with Molex PicoBlade connectors - compatible with servos and ESC designed to fit Futaba micro, Walkera and other receivers that use the 1.25mm pin space connectors. Channels 1-4 (Throttle, Aileron, Elevator, Rudder) have connectors, channel 6 (Aux) is available via pads on the circuit board. 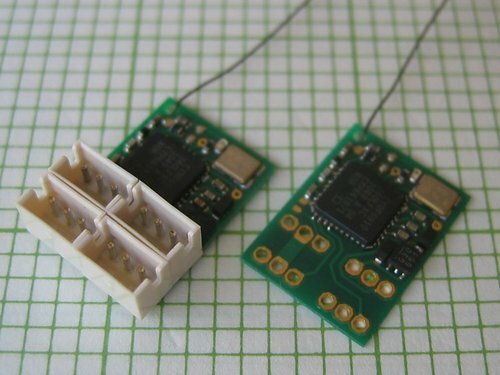 There are also two on-board 2A brushed ESC with motor connection via circuit board pads. Differential steering is available by mixing rudder or aileron into the ESC channels. 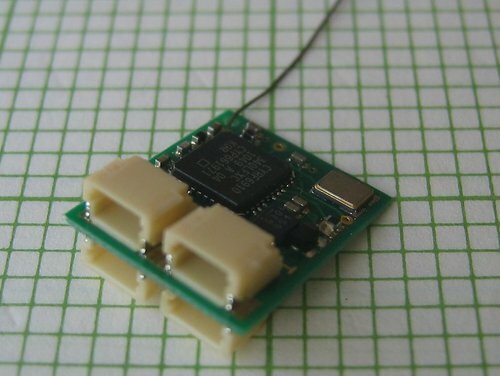 External ESC may be connected and make use of the differential mixing. Suitable 1.25mm pin space connectors are available here. View the Rx34d user instructions. Rx35d is a DSM2/DSMX compatible 6 channel micro receiver with JST-ZH connectors and 2 x 2A brushed ESC. Channels 1-4 (Throttle, Aileron, Elevator, Rudder) have connectors, channels 5 and 6 (Gear, Aux) are available as pads on the circuit board. Motor connections to both ESC are via circuit board pads and rudder or aileron can be mixed in for differential steering. External ESC, with optional ail/rud mix, may be connected to both throttle channels. Compatible JST-ZH connectors are available. The Rx35d is on the left of the image. 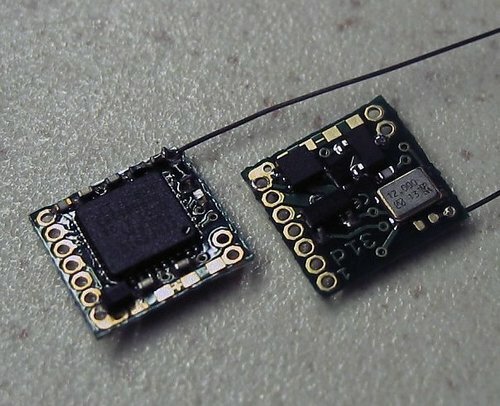 The receiver on the right is a bare board without connectors, weighing 0.35gm. View the Rx35d user instructions. Rx36 is a DSM2/DSMX compatible 6 channel micro receiver with standard 0.1" (2.54mm) pitch connectors. Channels 1-4 (Throttle, Aileron, Elevator, Rudder) have connectors, channels 5 and 6 (Gear, Aux) are available as pads on the circuit board. 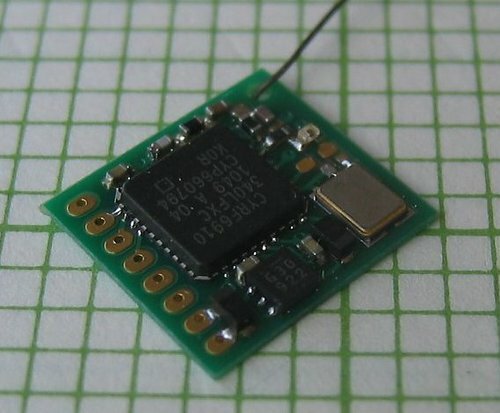 There is also an on-board 2A brushed ESC with motor connection via circuit board pads. An external ESC may be connected to channel 1 (throttle signal). The Rx36 with horizontal connectors is on the left of the image; with vertical connectors is in the centre of the image and as a bare-board with no connectors is on the right of the image. Download the Rx36 user instructions. Rx37-F is a DSM2/DSMX compatible 7 servo micro receiver for operation up to 10V and with twin on-board 2A ESC. The rudder or aileron channels may be mixed into throttle for differential thrust steering. All servo channels and both ESC outputs are available via pads on the circuit board. Rx37 is a Rx37-F without the on-board ESC FETs. This saves a small amount of weight and is intended for serious F3P flyers. View the Rx37 v3.4.4 user instructions. Rx27 is a DSM2 compatible 6 channel micro receiver with standard 0.1" (2.54mm) pitch connectors and greater range than the Rx36. Channels 1-5 have connectors and channel 6 is available at the opposite end of the circuit board; a connector may be fitted. DSM2 Only. All Rx27 stocked by Micron have version 2.x firmware; this supports a fail-safe facility on all channels. The channel setting at bind-time is remembered and servos are moved to this fail-safe position if the transmit signal is lost for more than 1 second. Full details are show in the Rx27 instructions. The Rx27 available from stock is in the centre of the image; the other variants, with channel 6 connector and with extended aerial, are available to special order (please contact us for details).